Following the termination of Verizon's early upgrade policy, the carrier might be ready to introduce new device payments plans. With some bad news comes good. 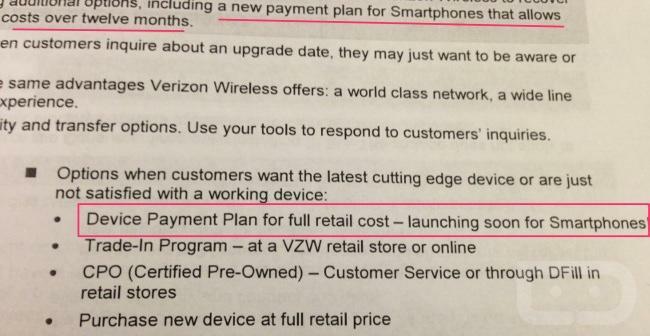 According to a leaked document, Verizon is willing to implement a device payment plan, launching soon, to take the edge off of full retail cost, similar to T-Mobile's recent Uncarrier initiative. Not many details are supplied by the document, but the language suggests Verizon customers can avoid signing a contract through the new payment plans. Verizon CEO Lowell McAdam recently admitted the carrier is open to ending contracts, so perhaps that initiative is coming up quicker than we thought. It's difficult to discern Verizon's intentions from just one sentence, so we're still not sure what to make of it. The more likely scenario is Verizon offering it as an option for those who are unhappy with the device they have or always want to be on the cutting edge. With Verizon's new early upgrade policy going into effect, perhaps we'll see Verizon follow in T-Mobile's footsteps soon. If a document is out there, presumably to train employees, it's only a matter of time.